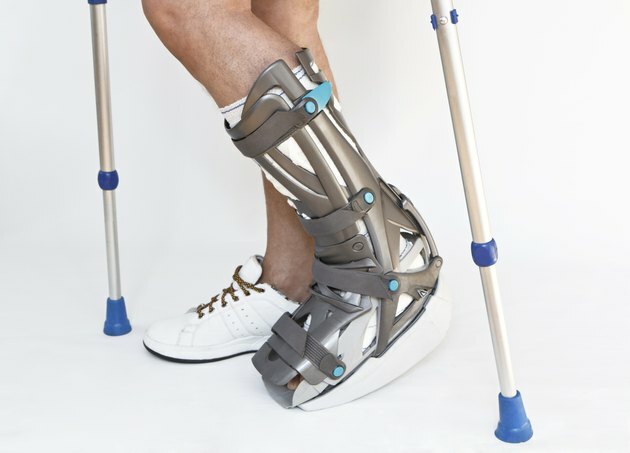 A walking cast may be made of fiberglass or plaster, and is built to support your weight as you walk on it without compromising its support of your injury. Some walking casts are removable; others are designed to be left in place for extended periods of time. According to DM Systems, without proper care, 40 percent of all walking cast boots will break down, requiring you to spend extra time and money at your doctor’s office. Having a walking cast applied doesn’t give you immediate license to go for a stroll. Wait until the cast is completely dry and hard first, or you may damage it and aggravate your injury. According to the American Academy of Orthopaedic Surgeons, it takes about an hour for a fiberglass cast to fully harden. A plaster cast may need to dry for two or three days before you can walk on it. Keep your cast dry at all times. This includes the obvious, covering it with plastic when you shower or bathe and keeping it out of the water as much as possible. But you should also be careful about getting caught out in the rain in your walking cast. After a little while in your walking cast, it may be tempting to stick a coat hanger into the cast to scratch an otherwise impossible-to-reach itchy spot. Don’t yield to the temptation; you could hurt yourself. Do your best to keep dirt, sand and powder, which might irritate your skin, out of the cast, too. Don’t pull the padding out from under your cast, or otherwise modify it, including breaking off rough edges or trimming it, without getting your doctor's go-ahead first. Like any other cast, you should inspect your walking cast regularly. Report any cracks or soft spots to your doctor, as they might compromise the cast’s support. If you’re not sure whether the cast can safely support your weight, stay off it. Inspect your skin around the cast, too, for any signs of redness, rawness or other irritation. Is It Bad to Walk in Soccer Cleats on Concrete?